Today I got an interesting anomaly email from a service I use called Next Big Sound. Actually, I don't use the service too much, but it crosses two of my interests: music and analytics. Next Big Sound aggregates music playback data from various music providers (Spotify, Pandora, etc) and also, apparently, tries to correlate changes in music plays with social media events happening in the real world (probably so you can see if given Event X generates a change in Plays). In addition to design consulting, in my "other life," I lead and perform in a dual-ensemble called Mr. Ho's Orchestrotica which has a few albums out that are available on Pandora. On first glance, I like the supporting evidence here (chart) and the lead-in text tells me thye are tracking what "normal" plays are such that they can alert me on abnormal increases. 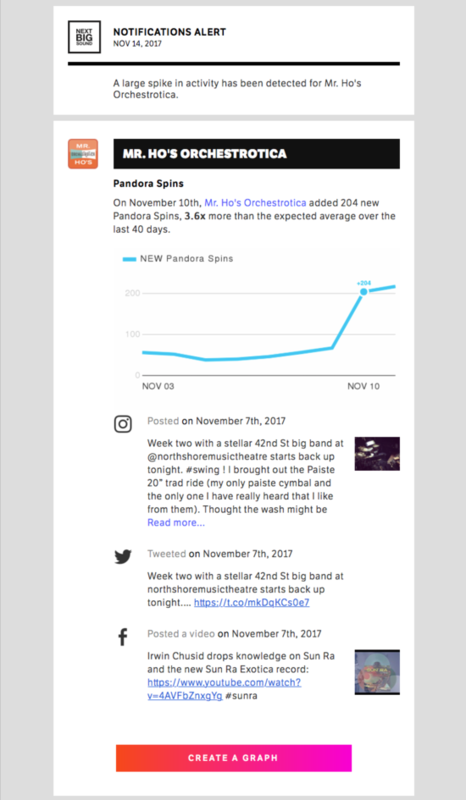 At first, I wondered why they were showing me some of my own social media posts, but then I realized they were trying to help me correlate whether any social media activity may have corresponded with the increase in plays. This is a great example of where they know their software probably cannot draw a literal causation relationship, but they can help users correlate and potentially find a causation. Incidentally, I actually don't care much about how many playbacks the Orchestrotica gets on streaming services as it's not a KPI for my group, but I found this a nice way to help artists and labels–especially artists working more in the pop/entertainment world–to understand what is going on with fans of their music, what is getting traction, etc. In this case, there is no correlation here; the social posts from my personal/artist social media accounts had nothing to do with Orchestrotica activities for the most part, but I still liked the UX. So, what do you think "Create a Graph" does? I wondered too. Stay tuned for Part 2 to find out.